For you early quitters!!! Don't forget, as you prepare to make your last few trips on the water with your boat, to add some fuel stabilzer to your tank. That way it's done and it's thru your motor properly for winter storage. Be certain that your live well(s) are dry and your pumps are free of any water as well ! First Boat storage post ...BOOOOOO! LOL Dave! Mine won't be going away until the lake is frozen. But I bought my stabilzer yesterday as the big bottles are on sale at CTC. It will get added somewhere late in October/Early November. 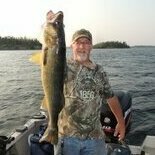 Boat will be coming home late in October and I'll winterize my livewells and power wash like I did last year before hitting GBay for Muskies 'till after the snow flies. Maybe I should dig that thread up to save someone some grief. A little birdy tells me someone here almost sunk their boat this spring thanks to a cracked pump! Maintenance is one of those things that you do now to prevent poop from happening later. Trailer bearings, take the hubs off, bearings out, clean, degrease and repack them before storing. If there's any moisture in them now and you let them sit that way all winter, don't say nobody told ya so. Jack up the axles and support the tires off ground, prevents flat spotting and give the tires a spin, keeps the bearing surfaces greased. Wayne thanks for the tip on the CTC sale , will pick up a bottle tonight. If you could did up that post re the winterizing of live wells that wouLD be great , especially if I plan to hit the Niagara in Dec.
Should be pretty simple with my set up as I don't have all the fancy bells and whistles. It's almost time for the battery storage debate. Thanks for the heads-up on the stabilizer sale. Ya, all the batteries stored on cement floors will die a screaming death. Ah yes...the cracked pump issue. I'm not the one that Wayne's referring to but something similar happened to me about 10 years ago on my Lund ProV. Mine was a cracked livewell valve and I almost sunk the boat in the lower Niagara.....twice! That's right, twice. After launching and filling the livewell in March to keep the minnows alive we motored down to the mouth of the river and began fishing. After a few minutes we noticed water on the floor. I pulled the hatch and found that the hull was full of water. So we booted it back to the launch while following the shoreline in case we had to ditch. We made it back and got the boat back on the trailer and pulled the plug to empty the hull. Figuring it must have been a loose drain plug we put her back in and repeated the run to L. Ontario. Again, after fishing for a few minutes I check the hull and noticed that it was filling up. Back to the launch and this time we called it a day. It was only after sticking a hose onto the livewell pickup that I saw what the problem was. The bilge pump was OK, I guess there was more coming in than the pump could handle. So now I check all of this before launching the first time in the spring and I'm more careful when winterizing as Wayne suggests. Packing all electrical connections with die-electric grease is a good one to add to one's list also. Just make sure to remove the corrosion first. I use this grease on every conn. from the trailer bulbs,trailer wiring to spark plug boots,engine wiring harness's etc..
That reminds me I have to make a antifreeze injection system for the 13 hp pressure washer thanks for the reminder Wayne. thanks for posting the great tips....ummm, you have to put your boat away in the winter , guess I am lucky, I fish the Niagara all winter, but I do take my precautions, I keep the deepcycle charged up after every use, the cranking battery gets charged a couple times a week when running the boat...I do however change the lower unit oil before winter just incase. If I use the boat and livewell alot and it gets wet inside, and I have to cover it up wet..I will put RV antifreeze in the livewell hoses, and put a bit in the bilge area as well then empty it out when I use it. I run the bigle pump and livewell pump for a few minutes as well ,I also make sure to tilt the motor back down all the way to let any water run out, and run my motor for a few seconds after I trailer the boat to try and spit out as much water as I can. On a side note though, I hear ya, I have to winterize my 9.9 for my 14 footer, pull the boat up on shore and take my dock out this weekend as well as winterize the water lines and hot water tank in my trailer this weekend coming. 'Tis that time of year again , fortunately I can use my trailer all winter..just no water from T-Giving weekend until May, and hydro is plug and play per use after that too, can't keep the trailer plugged in all the time in the winter. Here's the link to the livewell winterize thread from last fall. Feeling more confident in using the boat well into the fall this year . Just hoping we don't get dump of snow come November . After I jack up the boat I pull the tires for safe storage inside- my boat is stored a little remotely! I spray the hubs with a rust preventative as well. No tires on trailer help to prevent boat theft. You should add stabilizer to every tank if you're running a 2-stroke engine. I had a bad batch of gas a couple of years ago. It really buggered my engine. Not sure what the protocol is for 4-strokes, but it was recommended to buy midgrade fuel and add a stabilizer to every tank. So thats what I do and haven't had an issue since. I add stabilizer to my gasoline all year long. I bought some of the Stabil marine forumula stabilizer that's supposed to not only keep my gasoline from souring, but reduce the negative effects of ethanol on marine engines. thanks for the winterizing tips Irishfield. This is the first year I have to deal with the issue of winterizing a boat with livewells so the info will be helpfull. One question though (this might sound dumb) but I've never heard of a powerwash in a boat. What is it ? One question though (this might sound dumb) but I've never heard of a powerwash in a boat. What is it ? Something you spray other fishermen with when they get too close to your spot! Seriously... A wonderful tool to get the laker blood off your carpets before it dries. High pressure pump and 20 feet of hose is what I installed in mine. Also use it to clean the scum line off the hull thru the season. The unit was my main concern originally for winterizing as it's pump chamber and intake screen area don't appear to drain on their own...let alone the 20 feet of hose. Just what it sounds like. My boat doesn't have one of those toys in it so I guess I don't have to worry about that. One other question on the issue of winterizing - batteries. I installed an on-board charger this season that I leave plugged in all the time -keeping my trolling motor charged and my starting battery also (better safe than sorry). I'll be storing my boat inside an unheated building that will obviously get cold during the dead of the winter. I'm thinking I should take my batteries out and store them inside someplace during the winter - but obviously I don't want to disconnect my on-board charger to keep them topped up during the off season. How big a risk would I be taking leaving the batteries in my boat and plugged in all winter ? A fully charged battery will NOT freeze. The colder you can keep it will slow down the normal chemical reaction inside it allowing for longer battery life. I leave my battery disconnected in my boat and I will throw the charger on it once sometime through the winter. Never have had a problem. Why lug it out of the boat? Its where it belongs. No need to leave it plugged in Rob and would be a hazard to do so if your boat is covered. Plug it in every two months or so for the day to top them. I added an extension cord to mine to get the cord out from under the cover where I can easily plug it in when I desire to do so. I leave my batteries in and hooked up. Just make sure all your connections are absolutely clean and everything is turned off. Be certain that you have nothing in the boat the pulls any load (like a clock or electronic device) that would kill a battery while the boat sits unused. A battery that gets drained absolutely flat can sometimes be hard to get to polarize and charge again.